BOISE – (July 24, 2018) – With 61 confirmed wolf-livestock kills already documented in the state of Idaho from January to June 2018, federal authorities are expecting a busy summer after wolves killed seven sheep in three separate attacks in the Sawtooth National Recreation Area between July 9th and July 13th, officials said. 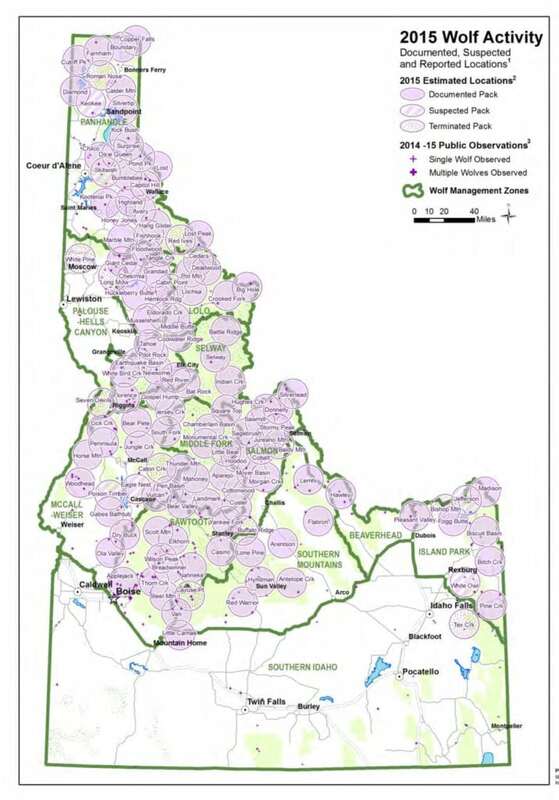 In fact, 23 years after wolves were reintroduced to Idaho beginning in 1995, federal authorities responded to a record 113 different sheep and cattle ranches in the 2018 state fiscal year to perform necropsies on wolf-livestock kills, where livestock kills were confirmed, and 217 ranch properties to investigate wolf kills overall, officials said. Both of those numbers set records. While environmental groups complained last week about Wildlife Services killing wolves in response to the sheep kills in July, officials with the Idaho Rangeland Resource Commission noted that Wildlife Services was simply doing its job. With at least 80 to 100 packs of wolves living in Idaho, wolves essentially occupy the entire state north of Interstate 84, and wolf populations are expected to continue growing, according to Idaho Department of Fish and Game officials. Wolves have expanded from Idaho into Washington and Oregon and they’re spreading into California as well. DNA evidence also indicates that wolves freely travel back into Idaho from Montana, Wyoming, Washington and Oregon. Mark Henslee, who runs Salmon Falls Land and Livestock with his brother Mike, said they had six guard dogs protecting one band of sheep that was preyed upon by wolves in the July incidents. The normal standard is two guard dogs per band of sheep to ward off coyotes, black bears and mountain lions. The Henslees had noise-makers and strobe lights set up at night around the sheep in hopes of preventing wolf kills. Wolves killed two ewes and a lamb on July 9th, they came back and killed two ewes and a lamb on July 10th, and then killed another lamb on July 13, Grimm said. After Wildlife Services took control action on three of the offending wolves (one of them was found next to dead sheep), the wolf kills stopped. Indeed, since wolf populations soared to more than 1,000 animals by 2009, wolves have killed more than 700 cattle and 550 sheep in Idaho, impacting a total of 412 different ranchers statewide. 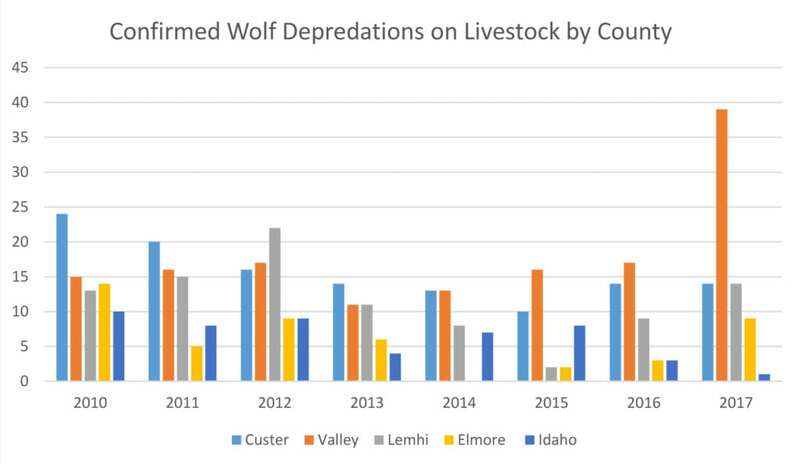 Lemhi, Custer, Valley, Idaho and Elmore counties have “chronic livestock depredation” issues, according to state and federal officials. 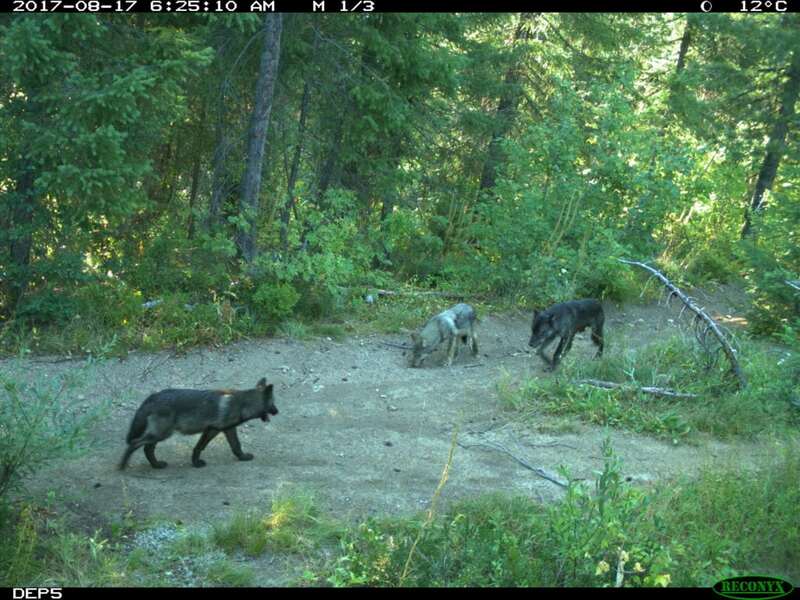 Last year, the number of confirmed wolf depredations in Valley County more than doubled from 17 to 38 after Cascade rancher Phil Davis and IRRC staff met with ranchers to discuss the different kinds of depredation that can take place. Davis has had at least one mother cow killed by wolves in which there was no outward signs of trauma on the exterior of the animal – until a necropsy was performed by Wildlife Services – and then wolf bite marks and hemorrhages proved that it was a wolf kill. Wildlife Services plays a critical role in protecting Idaho cattle and sheep ranchers from continued livestock losses, Peavey said, as does state-managed hunting and trapping of wolves. The Idaho Wolf Depredation Control Board, with funds from the Idaho Legislature, supports Wildlife Services’ control work to protect ranchers from continued wolf kills. Ranchers who have confirmed livestock losses should contact Josh Uriarte at the Governor’s Office of Species Conservation to request compensation funds and assistance with federal paperwork, 208-332-1556 or Joshua.uriarte@osc.idaho.gov.